The Hotel Tahiti is situated right on the beautiful beach of Es Pujols. Many rooms enjoy a fantastic view over the beach, across the bay and out to sea. This superb location is convenient for all the cafés, bars, restaurants and shops that the village of Es Pujols has to offer. The Tahiti is a family-run hotel which has recently been extensively modernised and enjoys a friendly and relaxed atmosphere. Standards are extremely high and guests are looked after very well and made to feel most welcome. The large swimming pool includes a spa area and pool-side bar which nestles in the shade in a corner of the surrounding terrace where you can soak up the sun in peace and comfort. The bar and salon area is stylish with several areas to relax in and watch one of the wide-screen televisions. The standard of accommodation is excellent. All Superior Double rooms have twin or double beds, TV, private bathrooms with showers, fridges, tea & coffee making facilities and private balconies with sea views. Towels are changed and rooms are cleaned every day. The beach to the front is surrounded by sand dunes and behind there are pine trees which fill the air with their scent. Close to the Hotel, on the beach, there is the excellent windsurf and sailing school, Wet4fun, with high quality surfing equipment and the latest Top Cat catamarans. 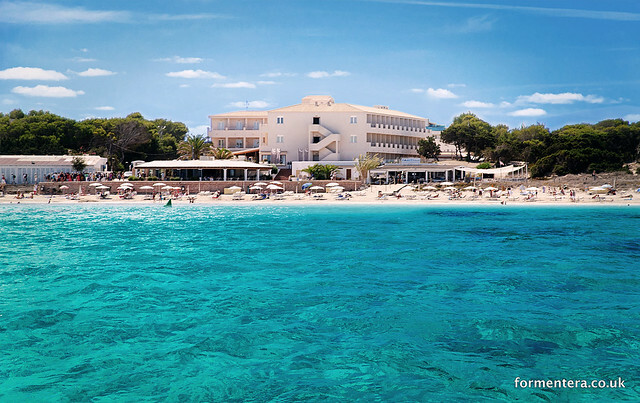 We are confident that the Tahiti offers a superb luxury hotel in Formentera and is an alternative to our villas and apartments if you are looking for a hotel-style holiday and it is thoroughly recommended by us and all our guests who have stayed here. WIFI available. Rooms may have twin or double beds. Photos shown may be representative of either standard or superior room type.